NEW "Dear Sindi" write in column! I have been writing articles for San Diego Pets magazine since September of 2008. I now have a "Dear Sindi" write-in column that I am very excited about! Below is my first write-in column published in the November/December 2009 issue. I'm trying to teach my ten month old puppy, Rigby not to jump on people. He's 22 pounds and I don't mind it, but I have young children and when their friends come over his jumping on them can be bothersome. Do you have any suggestions? Jumping up is a natural behavior for dogs, so unlearning it can take time and patience. The behaviors that we give the most attention to are the behaviors being trained, whether desired or not. If a dog jumps up and hears "no" or "down" or is pushed off, it is being acknowledged for jumping. Ignoring unwanted behaviors and rewarding preferred ones expedites training. Try this technique. When your puppy jumps up on you turn your back to him and act like a tree! When you turn around stand completely still. If your dog brushes up against you, licks your hand or continues to jump, it must be ignored. Do not move your hands or body or look at your dog. Each time you interact with your dog and he jumps up, repeat standing still like a tree. Consistency is important, so everyone in the household practicing the tree exercise will greatly assist with the training process. You can even "hire" volunteers to participate. Next it is important to consistently reward desired non-jumping behaviors. When your puppy has all four paws on the ground give him a treat, praise, pets or a toy. Reward with whatever is of high value to him. When guests come to your house it can be a whole new challenge, which is why "hiring" volunteers can be beneficial. The key is to be prepared and proactive. 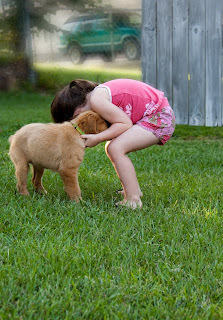 The less opportunity your puppy has to jump up and experience this behavior, the easier it will be to untrain it. Bring treats or other rewards on walks and public outings. You can reward him before he jumps as a distraction, but also to acknowledge your preferred behavior. Don’t be discouraged if your canine companion jumps up sometimes after all your hard work. Learning is a process! Do you know of any homeopathic treatments for gingivitis that might help my cat Juji? Not necessarily homeopathic, but natural alternatives, yes. Gingivitis is an inflammation of the gums caused by plaque build up. It can advance into periodontal disease which is a more serious condition. Having your cat examined by a holistic veterinarian knowledgeable about dental care may be beneficial to determine the severity of your cat’s issue. Regardless of this determination, good nutrition is essential for a strong immune system and healthier mouth. Administering a high quality multi-vitamin with C, A, E and other antioxidants is also beneficial. Reading the ingredients label on your pet’s food will help you to become your cat’s personal nutritionist. Corn, soy and wheat can lead to digestive problems, allergic reactions and contribute to dental illness in cats and dogs. Cats are carnivores and unless there is some medical reason to feed them otherwise, they actually don’t need grains. However, some felines do okay with small amounts. Along with corn, soy and wheat, rice, oatmeal, millet and barley are some of the grains found in pet foods. Eating grains and other starchy carbohydrates that turn into sugar may be aiding Juji’s gingivitis. Chewing on raw chicken necks can add an abundance of nutrients, enzymes and naturally occurring glucosamine and taurine to her diet while helping to clean her teeth. I suggest initially giving her the raw necks in short periods of five to fifteen minutes to allow her system to adjust. If the chicken neck is frozen, thaw it in the fridge. If she doesn’t go for the thawed raw immediately, sit it on the counter to be brought closer to room temperature. You may wish to pour room temperature or slightly warm water over the meaty bone for Juji. Never cook or microwave the chicken necks. I also recommend brushing your cat’s teeth. Start by gently touching Juji’s teeth and gums with your fingers. Over time progress to light massage. Then try using a small, soft bristled toothbrush found at pet stores and veterinarian’s offices. Pet toothpaste is also available, but check the ingredients as many include a sugar derivative. Sugar substitutes aren’t a benefit to their diet either. Lastly, FidoDent by Animals Apothecary is a liquid herbal remedy designed for cats and dogs with gingivitis and other mouth infections. Although I haven’t used this product personally, the company is highly regarded within the holistic pet care community. Available at holistically focused pet stores and online at www.animalessentials.com. Email sindi@wildtame.com with your nutrition, behavior, health or other pet questions and energy healing, reading and animal communication requests.